Busy life. It is the new normal. With many different things that make up your day; whether it be work, school, family, friends, sports, or errands, it can all add up to be a pretty hectic day. Luckily, there are quite a few options on the market to help make life a little easier. With your daily to- do list stacking up fast on you, even thinking about cooking dinner after a long day at work or a t-ball game can leave you cringing. Maybe you didn't get that hour to do your grocery shopping and all you have in your pantry is random items you aren't even sure would make a decent meal! Fortunately, we now live in a tech world that allows us to balance our priorities and allow more time to spend with what matters most to you. We have listed out a few of the top smart home devices of 2019. Speaking of the random grocery items, what if you had a refrigerator that could tell you what you can make with the items you have on hand? The Samsung Family Hub can do just that. This refrigerator can see what items you have inside, create shopping lists, read off recipes, and more. You can share your family schedules, stream music or videos, and even control other smart home devices! Who knew a refrigerator could do more than, well, refrigerate food? With today's tech trends, it is not uncommon to see an Amazon Echo in every house you visit. This is a hands-free speaker that connects to Alexa who you can ask anything and instantly get an answer or a task completed. Other than hearing Baby Shark for the upteenth time, you can ask the weather, set reminders, even order groceries for pick up or delivery (in certain cities with Amazon Prime). "Alexa, please order ice cream for delivery" should be pretty commonly said with this smart home feature. Next, let's explore the wi-fi enabled video doorbell. While there are plenty of choices on the market, we are going to spot light the Ring Video Doorbell. 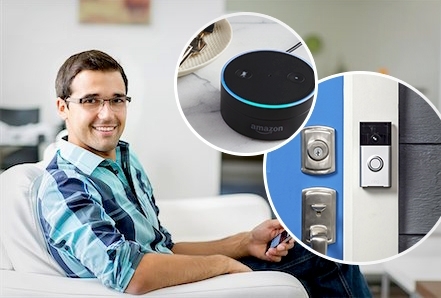 This smart doorbell let's you see, hear, and speak to visitors all from your phone! You get instant alerts when someone rings your doorbell or trigger the sensors. Whether it is the grocery delivery service or your best friend who popped in for a surprise visit, you will always know who is at your front door. The next few devices may have you in awe of how much technology has expanded. Have you heard of smart lighting? No, we don't mean the "clap on, clap off" lights. We are talking about the ability to turn off all your lights with one touch of a button or changing the color of your lightbulbs to create the perfect ambiance for any occasion. The Philips Hue collection is simple to install and has a variety of products from indoor/outdoor lights, switches, and sensors. Find the best one that suits your needs and start controlling your home, your way. Robot vacuum anyone? Of course, this is a must have for any smart home. The iRobot Roomba i7+ is a fan favorite due to it being the first vacuum to automatically empty itself! While robot vacuums are not a new thing, this one has a disposable bag that holds up to 30 robot bins. You won't have to worry about vacuuming when you have unexpected visitors! You can even customize where, when, and how your rooms are cleaned. That's what I call hands-off cleaning. Lastly, with all this talk of robot vacuums, say hello to the robot lawnmower. Can you recall a time when you knew the lawn needed to be mowed but you just didn't have the energy? Or maybe you procrastinated too long and it started to rain. Either way, the Husqvarna Automower 315X has you covered. It has the ability to squeeze into small spaces, travel through rough terrain, and is weather resistant. This automower ensures optimized coverage and uniform cutting results. You can have the perfect lawn without the physical exertion. This list could go on and on with the spectacular technology for your home. From smart locks, thermostats, speakers, and lighting, the possibilities are endless! Make your home a smart home today, and allow yourself more flexibility! Looking for some protection for the devices you have in your home? We protect a wide-variety of devices from accidental damage, theft and more! Click here to get a quote for device insurance today!